Have a professional check your wiring to ensure it is safe or give proper advice on replacement. Do you have Knob and Tube wiring? This type of wiring is not only old and inefficient but it poses a serious fire hazard and can be an accident just waiting to happen. 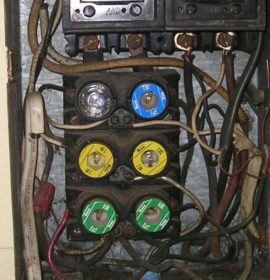 The demand for current was much lower back in the 30’s, 40’s, and 50’s when this wiring was nstalled. Todays electrical demands are 100 times what they were 50 years ago. The old knob and tube wiring worked well carrying modest currents and was considered a great system in its time. However, todays electrical demands include microwaves, air conditioners and computers. The average family electrical needs are considerably greater today and this puts and enormous strain on this type of wiring. joists with electrical wire snaking through them. This would indicate knob and tube wiring. The knobs (or insulators) keep the wires isolated from objects, and the ceramic tubes are used to line the holes through the wooden floor joists. Even if you have upgraded your service, the additional demands can overload this wiring. Simply replacing the original fuses with oversized fuses is not sufficient to prevent fire hazard. For safety purposes, if you upgrade your panel, or the electrical service in your home, you should upgrade the wiring. Also, many insurance companies will not renew policies unless older and outdated knob and tube wiring is replaced. Be safe, have a professional check your wiring and give you proper advice on its replacement needs.